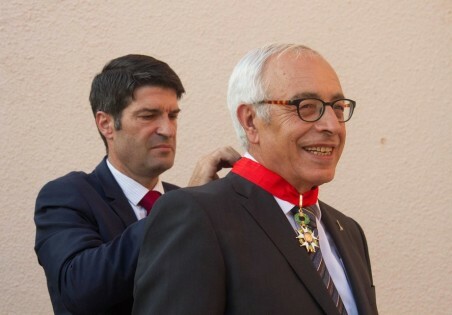 Jerusalem, June 29, 2016 — Ambassador Yossi Gal, the Vice President for Advancement and External Relations at the Hebrew University of Jerusalem, has been named a Commander of France’s Legion of Honour. The honour was presented at a ceremony hosted by Mr. Patrick Maisonnave, the Ambassador of France to Israel, at his official residence in Tel Aviv yesterday. Established by Napoléon Bonaparte in 1802, the Legion of Honor (Ordre national de la Légion d’honneur) is the highest French order for military and civil merits. As Vice President of the Division for Advancement and External Relations at the Hebrew University, Ambassador Gal works to enhance the University’s relationships with its many Friends of the Hebrew University organizations around the world. A veteran of the Israeli Foreign Ministry, he served as its Director General and, immediately prior to joining the Hebrew University, he served as Israel’s Ambassador to France. “As Vice President of the Hebrew University, an institute which was a home to Einstein, Freud, Buber, Bialik and Chaim Weizmann, I appreciate even more today France’s contribution to the world of sciences — mathematics, medicine, literature and culture,” said Ambassador Yossi Gal. Born in Jerusalem, Ambassador Gal completed his elementary and high school studies in Jerusalem and graduated from the Hebrew University. Following his military service and university studies, in 1975 he began his career in the foreign service of the State of Israel. Among his many posts at the Ministry of Foreign Affairs, he served as Director of the Information Department, Deputy Director-General for Communications, participated in the peace negotiations with Israel’s neighbors, and chaired the Israeli delegation to the multilateral peace talks on the environment. He then headed the Press and Communications Department at the Prime Minister’s office, served as Deputy Director-General for Economic Affairs, was then promoted to Senior Deputy Director-General and then Director General of Israel’s Ministry of Foreign Affairs. Abroad, he served twice in Washington (1976-1981 as Director of the Ambassador’s office, and 1985-1989 as Spokesman of the embassy), then as Ambassador of Israel to the Netherlands (1995-2001), and Ambassador to France and Monaco (2010-2015). Ambassador Gal participated in the Madrid Peace Conference, was a member of the peace negotiating team with Jordan and the Palestinians, headed the diplomatic process of Israel’s adherence to the OECD, and led the negotiations on upgrading relations with the EU.